After launching the BR-X2 Tourbillon Micro Rotor last year, Bell & Ross this week offers a skeletonized version of the watch, where, once again, the case and the movement are one in the same. Now, the movement is fully visible, pared down and set between two sapphire crystals. Now pared down to essentials, the movement’s very dense tungsten micro-rotor can be admired as it sways to power the two-handed tourbillon timekeeper. While on most watches with a flying tourbillon, the regulating organ itself would be the visual highlight. Here, though the tourbillon’s stylized B dutifully denotes the seconds, my attention is drawn to the spaciousness within the sapphire. The watch’s clean, architectural layout draws attention only to the primary time-keeping components, each nicely polished amid a minimal set of curving, satin-brushed bridges. I challenge you to find a right angle anywhere here. The curved edges inside perfectly complement the well-known rounded corners of the Bell & Ross square case. The luminous (and rounded) metallic applied markers are actually set on their own bezel-shaped bridge, just underneath the sapphire crystal, adding another pleasing layer of dimension to the piece. Bell & Ross again demonstrates that it can do wonders within its well-known square case. Here it’s kept at 42.5mm across and 9mm in depth (including the surprisingly slim 4.05mm-thick movement). The BR-X2 Skeleton Tourbillon Micro Rotor nicely melds timekeeping basics (albeit with a flying tourbillon setting the precision) and an eye-pleasing contemporary skeleton design. 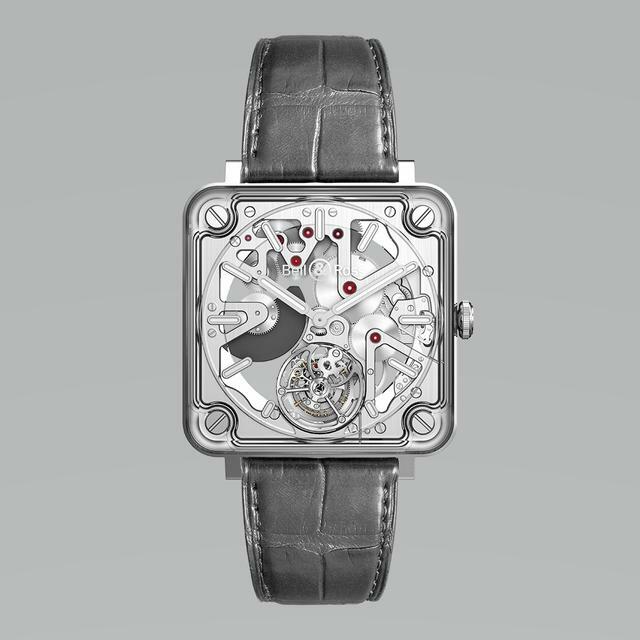 Movement: Automatic Caliber BR-CAL.381, 4.05mm thick with micro-rotor and flying tourbillon. The micro-rotor is machined in a very dense alloy called Reconit 18. This alloy contains 95% tungsten. Dial: Skeletonized with metal applique Superluminova®-filled indices. Metal skeletonized Superluminova-filled hour and minute hands. Strap: Grey alligator with folding, satin-polished steel buckle.